Can be custom cut to any size up to 40"
Use with our WFC41 or WFC42 Clips. 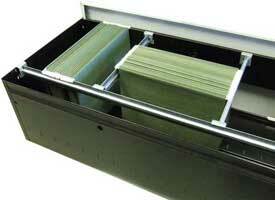 Part # WFB40 Standard 40"
A- For Side-to-Side filing Measure the inside distance from drawer wall to drawer wall. 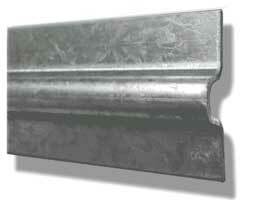 Then subtract 1/8" for the actual bar length. 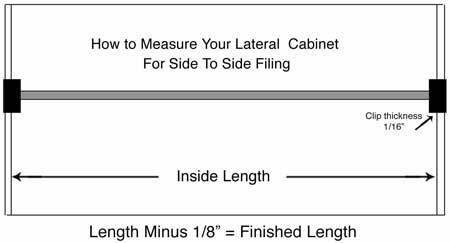 (see table as example) Each clip takes up 1/16" (see above) Cut the rod to the required dimension using a hack saw, chop saw or band saw. If needed, use a file or piece of fine grit sandpaper to knock off any burr that may occur. First determine if there is a lip or edge that the clip can attach to. If so, the above instructions apply here also. If not, than you must first create a side-to-side filing bar it now becomes the edge that the front-to-back bar attaches to. *Don't forget to remove any sharp edges with a file.